Centennia Research Edition, or CRE, has been designed for professional academic research and analysis by historians, political scientists, and economists requiring basemap data for political entities in Europe and the Middle East during the past ten centuries. The maps may be imported into any modern GIS analysis system. Centennia Research Edition is being used in current academic research in econometric history. Here's a preview of an upcoming article: Creative Destruction in the European State System : 1000-1850 by David Schönholzer, Eric Weese. The database in CRE is a strategic asset of Clockwork Mapping constituting a storehouse of intellectual property for our Centennia Historical Atlas products, both now and in the future. Because of this critical value to us, and since the data is rare and valuable to research, we price CRE at a high level as a professional tool, and we further require signed contracts guaranteeing controlled access to and protection of the data. Licenses for Centennia Research Edition start at $9500 for the database, as is. We provide samples for analysis prior to licensing but full access is granted only upon payment and delivery of signed licensing contracts. If any modification of the database is required, or if any additional features are required, licensing fees may be substantially higher. Complete internal database of all Centennia Historical Atlas entities. 4.5 gigabytes of data (zip compressed), 18G uncompressed. Standard KML data format, compatible with all modern GIS. Polygons and identifiers at all dates. Political polygons extend past coastlines. Merge with any coastline overlay. Complete KML coverage for every tenth of year. Since the KML data format was originally developed for use in Google Earth, the map overlays for any given date in Centennia Research Edition may be viewed and projected directly in Google Earth out of the box with no processing. The examples below show some dramatic bird's eye views. The first shows Napoleonic France in 1812 looking toward the southeast from above the mouth of the English Channel, La Manche. 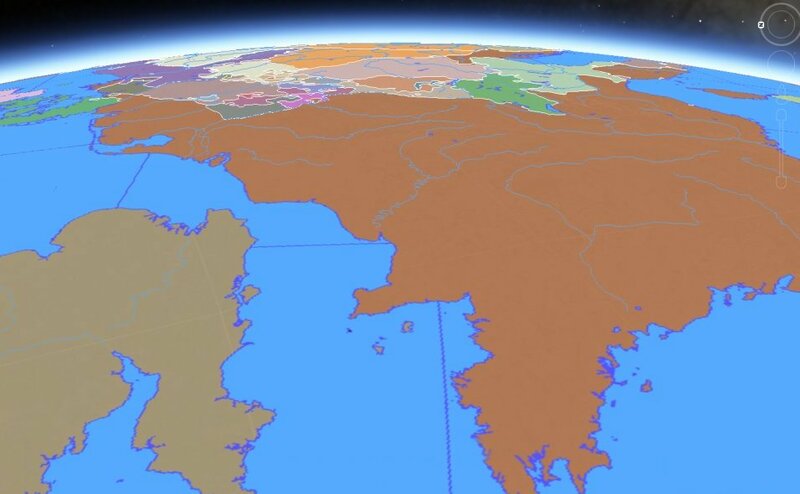 The French Empire at this date is so vast that its furthest limit, the Illyrian Province (largely modern Croatia) sits on the horizon in the distance. 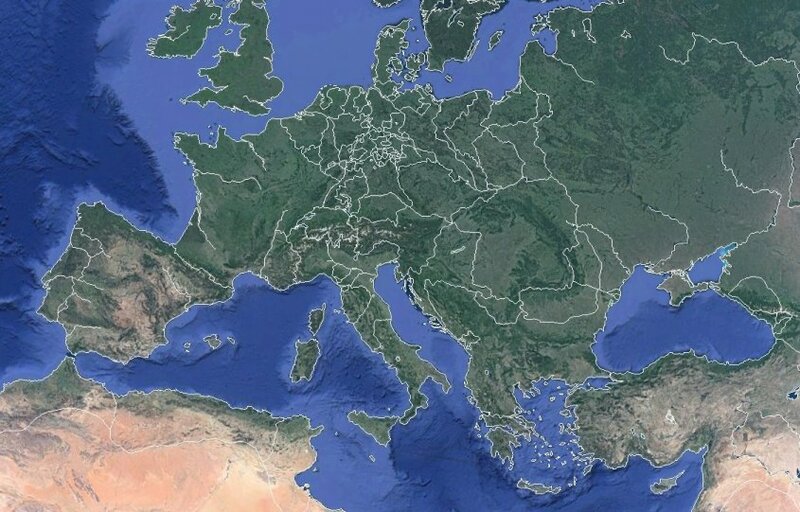 In this view, borders of Europe in 1830 are projected directly onto the standard Google Earth physical earth view. 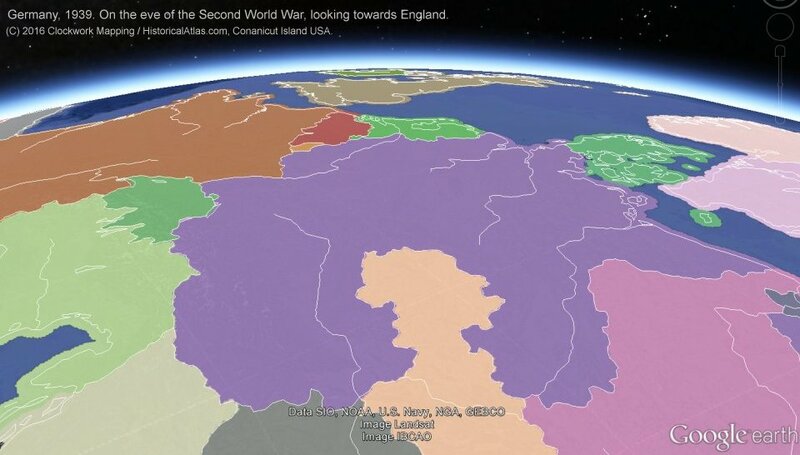 Here we see Europe on the eve of the Second World War projected using CRE data. Germany has annexed Austria and the Sudetenland. We are looking from high above Hungary towards Britain in the distance. The Polish Corridor can be seen extending to the sea in the Baltic. 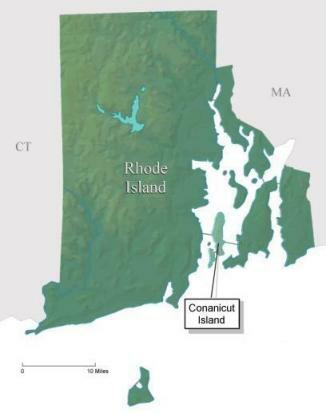 Note that in this view the political entities extend beyond the coastline. This is the natural condition of the political polygons, allowing the researcher to merge the data with any appropriate water/ocean overlay.